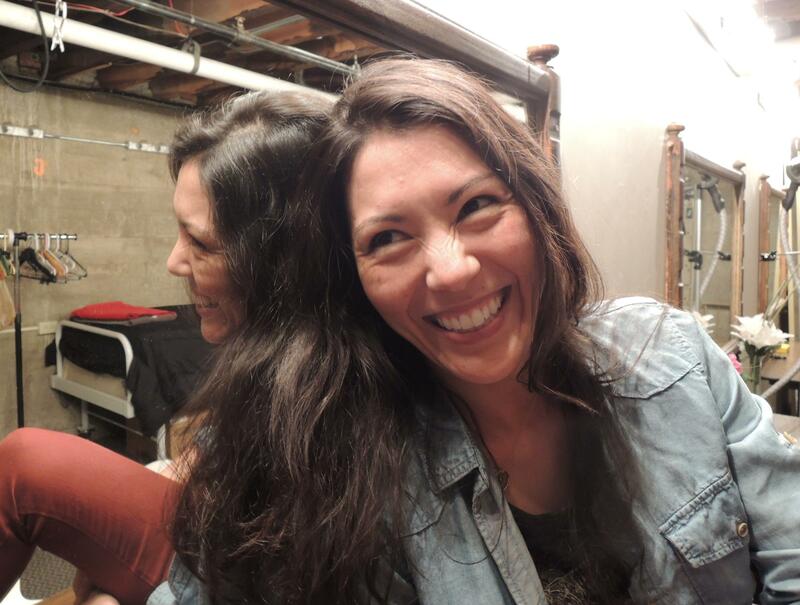 Carie Kawa is a Los Angeles-based actor starting in BCT's new original play, The Uncanny Valley. Cowriter/co-director Dwayne Blackaller leaves his seat in house and comes onto the stage to look at it from Kawa’s perspective. They have an intense discussion about manipulating the picture. Does the audience need to see it at this point? Can the actors stand closer together so Kawa doesn’t have to flip the picture around? I’ve been following Blackaller and fellow writer/director Matthew Cameron Clark for a few months as they write this play. But I came to talk with Kawa about rehearsing a play that’s not entirely written. “I didn’t even read the second half of the script until our first day of rehearsal,” Kawa says. She had read the first half three weeks before rehearsal started but at that point the second hadn’t been written. Writers Blackaller and Clark are also putting their faith in Kawa. They wrote the character Sidney just for her, though the abrasive photographer bears little resemblance to Kawa’s own personality. She says they wrote Sidney to play to her strengths and to stretch her abilities. She says that's an amazing gift for an artist to receive. She’ll be part of the play’s opening night birth April 5. She was also around for its conception. As Kawa was wrapping up the run of the play A Nighttime Survival Guide at BCT about a year ago, Blackaller and Clark were kicking around the idea that would become The Uncanny Valley. Kawa says it’s thrilling to be part of forming a new play. She compares it to fresh clay she gets to put her mark on. But she also says it’s terrifying to work on a play that continues to change as opening night approaches. Take one of the most basic things an actor does, memorizing lines. Though impressive to many people, memorization is not really a big part of an actor’s craft. Think of learning lines as the foundation an actor lays before he or she can start building. But when the foundation moves around it’s harder to put up the walls and windows. Kawa says for her the lines come out of the thoughts. So when she reads a play in advance she can track her character’s emotional development. 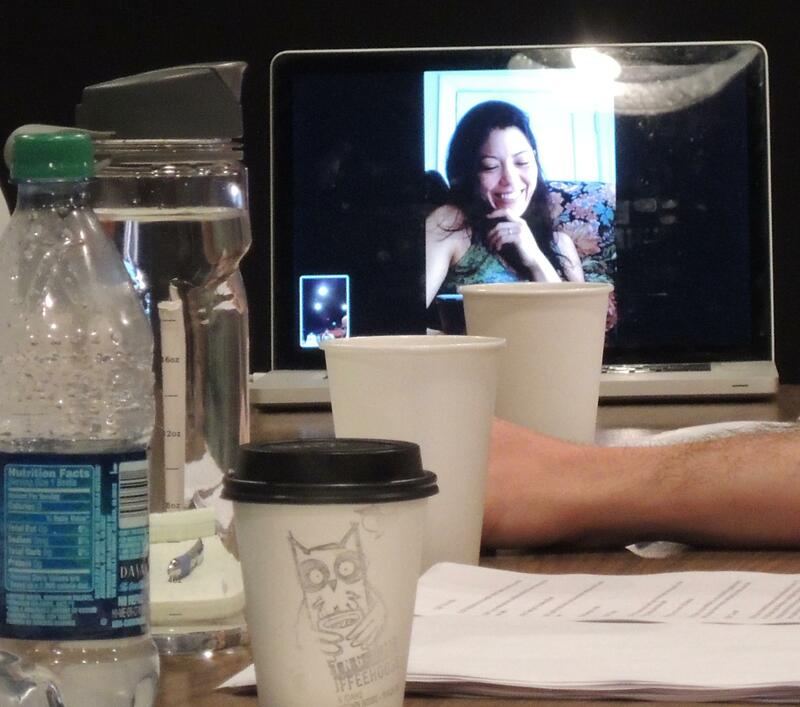 Carie Kawa joined the first table reading of The Uncanny Valley by Skype. Kawa says when she showed up for rehearsal she got a whole script with the act that had been missing just three weeks earlier. She says since rehearsals began there have been some changes but so far, she says -holding up her hands with her fingers tightly crossed - no major overhauls. That’s different from the last time Clark and Blackaller wrote and directed a play together. That play was A Nighttime Survival Guide, which Kawa costarred in. It sold more tickets than any show in the theater’s history. Blackaller says when rehearsal began for that they had 25 to 30 pages written and additions and changes came unrelentingly throughout the process. “I think I’ve repressed that trauma,” Kawa says laughing. She does recall some panic about being ready for opening night. She says The Uncanny Valley is certainly more done in terms of writing but Kawa says it has challenges Survival Guide didn’t. She says Uncanny Valley is a more complicated story with more complicated characters and relationships. On Survival Guide she was worried about the mechanics like if the script and props would be ready on time.